You can try and call my bluff but I can’t remember a year in my life where I have been so head over heels for the nature and colors that make up the autumn season. As a child, the fall meant the end of summer and the start of a new school year hence homework and high-anxiety Sunday nights; I think many can relate. This year, however, holds so much more. After exiting my car in the early morning and walking through the concrete parking lot, my eyes are distracted by the intense colors that cover the ground. Vibrant reds, fire oranges, intense yellows and that shade of lime that strikes a cord in my heart, sprinkle the earth in pointy geometric shapes. I collect a large quantity and use them for art making and nature explorations in the classroom wherever it supports my curriculum. Early Childhood artists have been observing the fall colors and singing about the actions they perform in nature during the autumn. I play the xylophone to a simple melody and sing a song I wrote that was inspired by my rekindled love of this colorful season. Children are mezmorized by the gentle high-pitched sound of this musical toy and easily follow along in song and hand gestures. With the help of the collection of leaves I found earlier that morning, we have a visual, tangable resource to inspire our art. 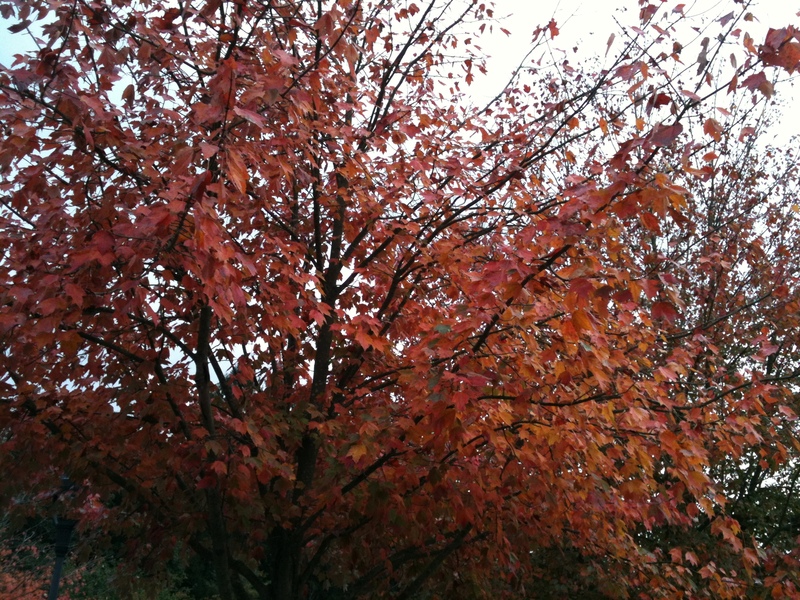 We discuss the colors and shapes we see and notice that not each leaf is the same shape. Some have three points, others have 5 and this one has, let’s count: 15! As a supporter of Inquiry-Based learning, my learning objectives are to challenge students to observe, analyze and make connections. Therefore, my questions do not have “yes” or “no” answers. Rather than ask “what shape is this leaf?” I ask “what do you notice about the shape of this leaf?”. This allows every student to feel comfortable to share their ideas and also opens up the discussion for an endless amount of creative possibilities. 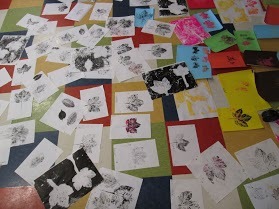 I offer a limited palette when creating collage, painting, and drawing during these fall art explorations. 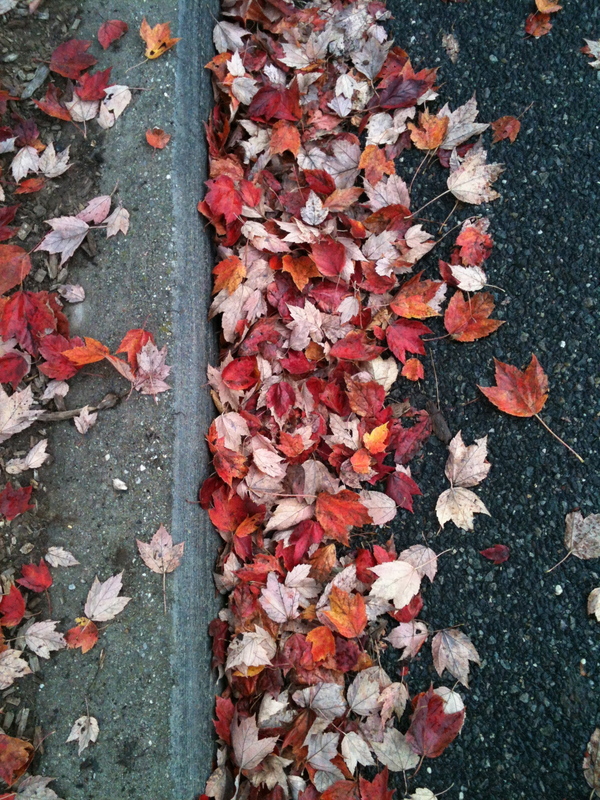 Brown paper is the ground and the space where we collage our falling leaves. Colored tissue triangles are the leaves that are fragile and pointy. Yellow and Red can be mixed to recreate the various orange hues that dress the fall leaves and are painted with patterns that mimic the motion of leaves touching the ground. 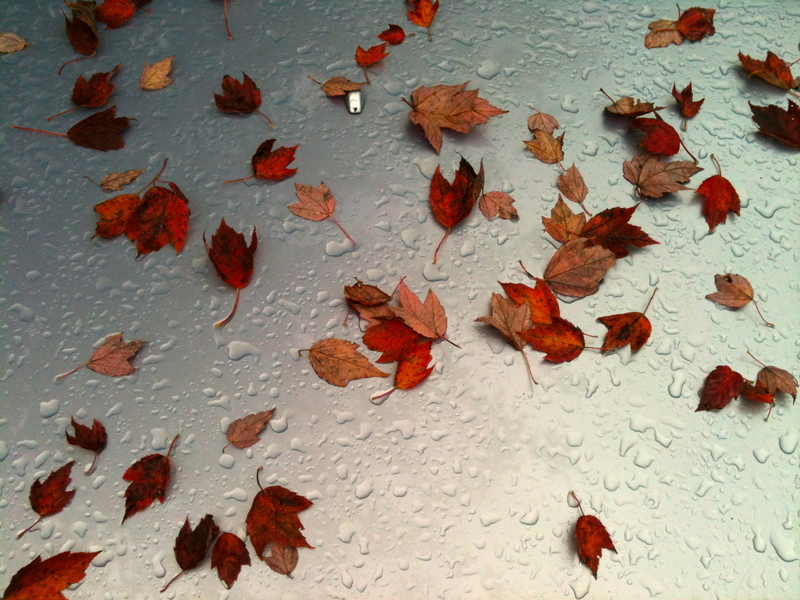 Oil pastels can illustrate the falling leaves. I make an effort to ask the students about the shapes and lines I notice in their compositions and write their direct quote in small, neat pencil at the bottom of their drawing. The product is not my concern, rather a positive experience with the art process and the connection they make to the content determines my material choice and activity structure. Once you have an objective in mind (a goal for what you want students to learn and become aware of), format and plan your learning experiences to achieve your goal. Elementary artists are introduced to contour drawing with the help of the various types of leaves I collect that morning. Note that leaves don’t last longer than a day inside so my collections were frequent and fresh for each art experience (if time is on your side, a quick trip outside will allow students to scan the local harvest and choose a selection of inspiring material). Students carefully observe the curves, dips and sharp angles that form the edges of the soft delicate forms and use black felt-tip pens to draw their observations. Students soon noticed the texture found on the underside of the leaves and inquired about what they saw. We discussed how veins bring nutrients to all areas of a leaf’s surface and made a connection to the veins in our own bodies and discussed how they carry blood and oxygen to every part of our body. Texture was further explored through leaf prints using black ink on white paper. Students discovered so much more about the details and patterns found in leaves when they observed the textures that the process of relief printing offered to the naked eye. What other material would be able to display the textures found in a leaf? 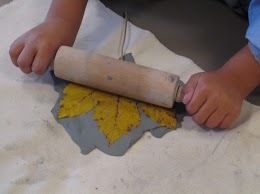 Students pressed leaves into clay with the help of a rolling pin and carefully lifted the pointed subject. 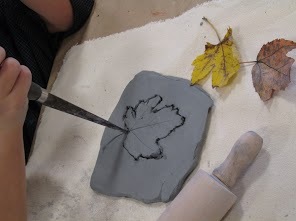 A beautiful impression was left in the clay and students were motivated to use a clay knife to follow the contours of the leaf and cut out its elaborate shape. Colored underglazes can be used after a bisque firing to make these hard-to-see details more prominent. See the link for clay relief below. At the end of the class period, students had made at least three clay reliefs and joined them together to form a fall inspired sculptural work of art. Are you inspired to bring nature inside for a creative artmaking experience? If so, view the list below for a selection of engaging and meaningful hands on learning. Leaf prints in clay (clay, rolling pin, clay knives, colored underglaze, clear gloss glaze) learn more here. And if you crave direct contact with a human being to answer your questions, as do I, feel free to email me anytime at sunporchartstudio@gmail.com .